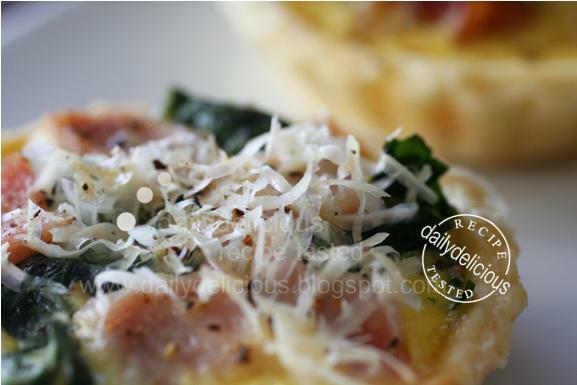 dailydelicious: Quiche a la carte: Do it the way you want! "HAPPY NEW YEAR 2010, Wish all of you happy all this year ! " Last month, my life was a bit busy, both about work and family. My niece just become 1 month old last week, so you can doubt about how busy the situation in my home was. But this month thing will be better (I hope, ^ ^), as everyone in the family accustoms to the situation. For me, well, I still bake as always, haha, and I really wish that my niece grow up quicker, so she can eat my foods too (I hope that she will love chocolate and has a sweet tooth just like me, haha,). Anyway, do you still have more party to prepare ? Because I have more party foods to show you, ^ ^. 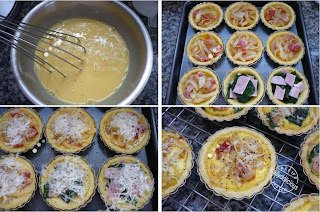 This quiche will be great for any party, and because you can prepare the pastry before time, (it's easier for any party, if you can do something ahead). You can put the pastry in the table and let your friends put the topping by themselves because the filling is taking only 20 minutes of the baking time. 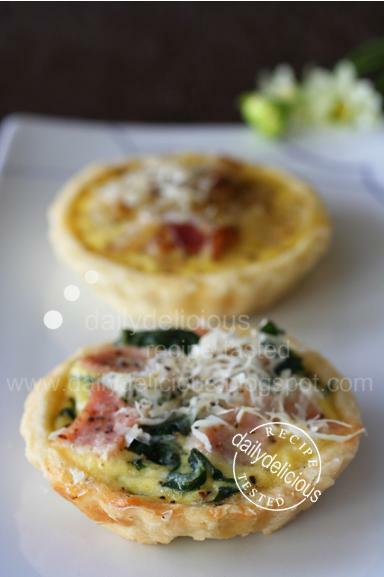 Your friends will have the custom made quiche, the way they really like. I love the idea of this quiche, because there is some moment that we want to do the thing in the way we want. This quiche, you can put the topping that you like, onion, bacon, spinach, mushroom or etc. So, I didn't write the amount of the filling because the amount of it will be up to you, haha. 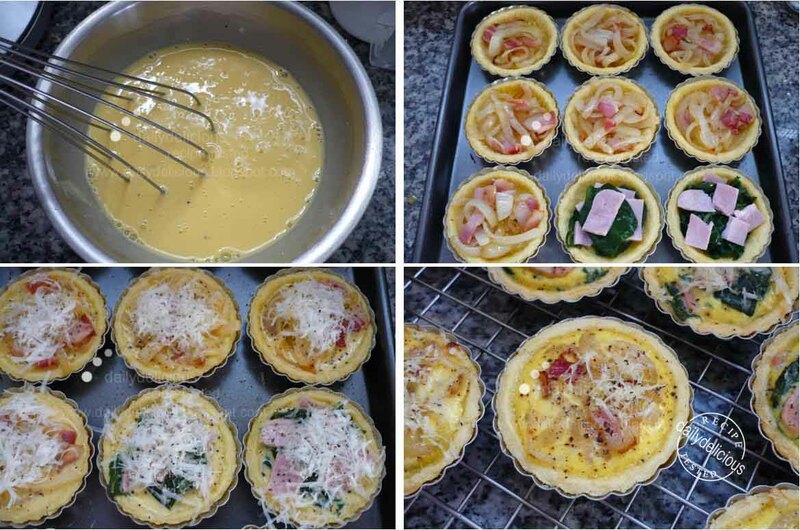 The recipe comes from the book that I bought a long time ago (about 6 years, >*<), 信太康代のスタンダードレシピ パイとタルト (Shida Yasuyo standard pie and tart recipes) by 信太 康代 (Yasuyo Shida). And well, I have to admit that this is the first recipe that I try, haha. 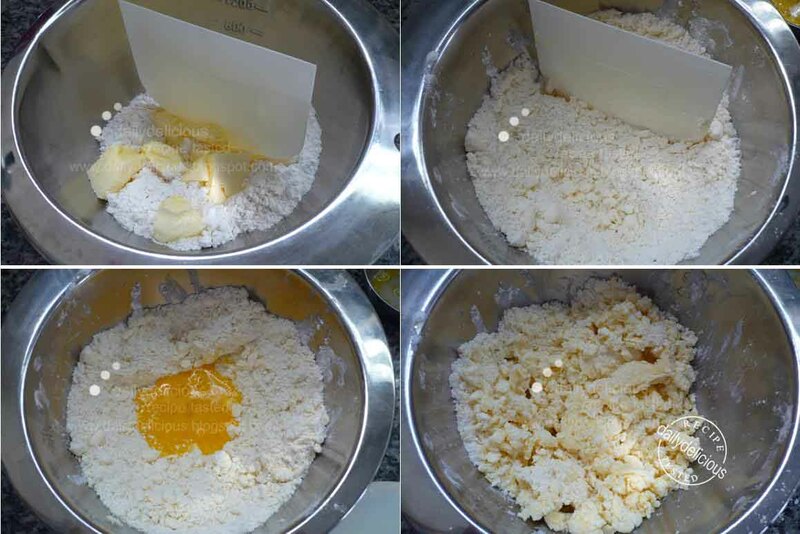 Put the flour, salt and butter in the bowl. Cut the butter into the flour, then add the egg and water mix until moisten. Pour the mixture out of the bowl and knead lightly until combine and shape into a ball. Wrap the dough and refrigerate for 30 minutes. Brush the tart pan with the butter. Roll out the pastry on a lightly floured work surface to 3 mm (1/8 inch) thick. Cut into rounds to fit the base and sides of the tins. Gently press into the sides to fit, trim the edges, cover with plastic wrap and refrigerate for 30 minutes. Sauté the onion until golden then add the bacon and sauté until the bacon is lightly brown. 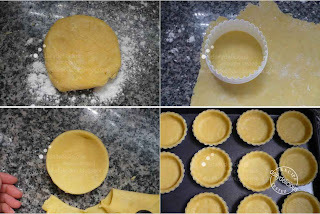 Line each pastry shell with baking paper and fill with baking beads or uncooked rice. Bake for 15 minutes, then remove the paper and weights and bake for 5 minutes, or until the pastry is golden. 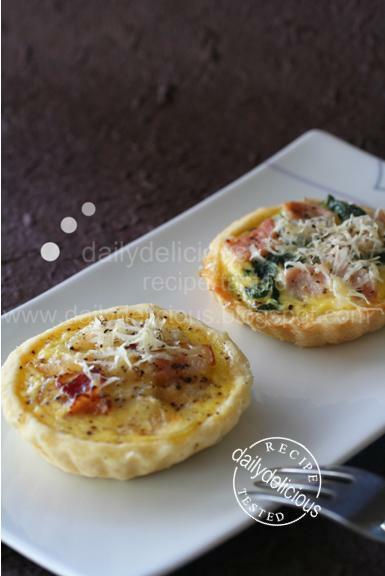 Brush the pastry with the egg after taking out of the oven. Reduce the oven to 170°C. Mix the cream filling together. Put the topping into the tart and pour the cream filling over, and sprinkle with the mozzarella cheese and parmesan cheese. 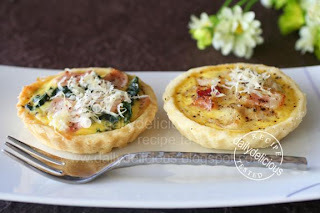 Happy new year...wish you all the best and thanks for all delicious recipes.